Instead of recording images on film, digital cameras store pictures on memory cards. 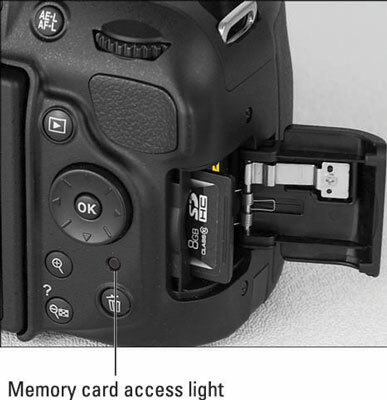 Your D5200 uses a specific type of memory card — an SD card (for Secure Digital). Most SD cards sold today carry the designation SDHC (for High Capacity) or SDXC (for eXtended Capacity), depending on how many gigabytes (GB) of data they hold. SDHC cards hold from 4GB to 32GB of data; the SDXC moniker is assigned to cards with capacities greater than 32GB. Inserting a card: Turn off the camera and then put the card in the card slot with the label facing the back of the camera, as shown in this figure. Push the card into the slot until it clicks into place; the memory card access light (labeled in the figure) blinks for a second to let you know the card is inserted properly. Formatting erases everything on your memory card. So before you format a card, be sure that you’ve copied any pictures or other data on it to your computer. If you accidentally erase valuable data, don’t panic, though. You can buy data-recovery software that may be able to retrieve the missing files, and some companies also offer this service — a quick online search will turn up lots of options. To give the recovery process the best chances of success, stop shooting and remove the card from the camera immediately. There are no guarantees, but it’s worth a try if you really need that deleted data back. Format the card by using the Format Memory Card option on the Setup menu. Some computer programs enable you to format cards as well, but it’s not a good idea to go that route. Your camera is better equipped to optimally format cards. The blinking letters For in the viewfinder mean that the card requires formatting. On the monitor, the camera displays a less subtle message: “This card is not formatted. Format the card.” Either way, the camera won’t let you take any pictures until you give in to its formatting demand. 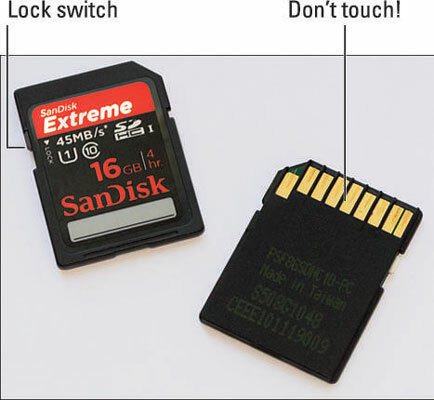 Removing a card: After making sure that the memory card access light is off, indicating that the camera has finished recording your most recent photo, turn off the camera. Open the memory card door, depress the memory card slightly until you hear a little click, and then let go. The card pops halfway out of the slot, enabling you to grab it by the tail and remove it. If you turn on the camera when no card is installed, the symbol [-E-] blinks in the lower-right corner of the viewfinder. The image area of the viewfinder also displays a blinking memory card symbol. A message on the monitor also nudges you to insert a memory card. If you do have a card in the camera and you get these messages, try taking it out and reinserting it. Handling cards: Don’t touch the gold contacts on the back of the card. (See the left card in this figure.) When cards aren’t in use, store them in the protective cases they came in or in a memory card wallet. Keep cards away from extreme heat and cold as well. Locking cards: The tiny switch on the side of the card, labeled lock switch in the figure, enables you to lock your card, which prevents any data from being erased or recorded to the card. Press the switch toward the bottom of the card to lock the card contents; press it toward the top of the card to unlock the data. You also can protect individual images on a card from accidental erasure by using the camera’s Protect feature. This protection doesn’t apply to formatting cards, however; it only works for pictures that you try to delete using the camera’s Delete function. Using Eye-Fi memory cards: Your camera works with Eye-Fi memory cards, which are special cards that enable you to transmit your files wirelessly to other devices. That’s a cool feature, but unfortunately, the cards themselves are more expensive than regular cards and require some configuring. If you do use Eye-Fi cards, enable and disable wireless transmission via the Eye-Fi Upload option on the Setup menu. When no Eye-Fi card is installed in the camera, this menu option disappears.